This visual curiosity beats the black/gold dress craze of last month. The video above asks you to look at a photo and decide whether you see Albert Einstein or Marilyn Monroe -- two 20th century icons who look pretty much nothing alike. If you say Albert, your eyes are in good shape. If you say Marilyn, it's apparently time to pay a visit to the optometrist. The science discussed here is based on the research of Aude Oliva, who works on Computational Perception and Cognition at MIT. You can see the original "Marylin Einstein" hybrid image above, which Aude created for the March 31st 2007 issue of New Scientist magazine. More background info on hybrid images can be found on this MIT page. Plus find a gallery of hybrid images here. Dan Colman is the founder/editor of Open Culture. Follow us on Facebook, Twitter, Google Plus and LinkedIn and share intelligent media with your friends. Or better yet, sign up for our daily email and get a daily dose of Open Culture in your inbox. The 430 Books in Marilyn Monroe’s Library: How Many Have You Read? With my glasses Albert. Without Marilyn with a big nose and a mustache. How can any one see Einstein with or without glasses???? I would venture to guess that most people see Einstein. Right? I see black and gold. How can any one see Monroe with or without glasses???? PS. Oh, actually I see MM -and only her- in the small grab shot of Openculture on my top sites grid…..
@Pet, No really my eyes are bad. I’m seeing Einstein all the way out to 10 feet at the original size on this article. I guess that means my eyes are 20/20 then. 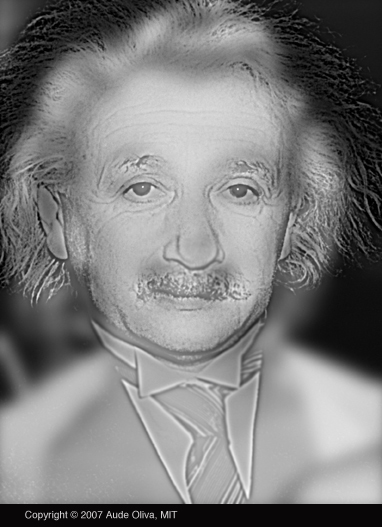 Can you buy the Einstein/Munroe eye test picture?